Lloyd’s insurers faced a number of headwinds in the first half of 2014. Competition, particularly in international reinsurance lines, has resulted in rate cuts, subduing growth. The relative strength of the pound has also resulted in large foreign exchange losses for several companies. And although the claims environment has been relatively benign, as it was in last year’s first half, companies have had large claims to deal with. As a result, the financial performance of many Lloyd’s insurers deteriorated. On the positive side, all companies remained comfortably profitable, and continued to benefit from prior-year reserve releases. In addition, investment returns have started to pick up after a prolonged period of slim pickings. Here, GR’s sister title Insurance Times analyses the effects of these conflicting trends on the first-half results of the six listed Lloyd’s insurers. 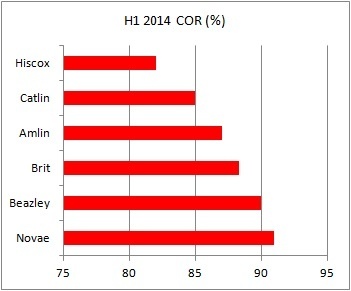 Hiscox was the best performing underwriter in the first half of 2014, based on its combined operating ratio (COR) of 82%. This was despite the fact that the company’s COR suffered the biggest deterioration in the group by quite a way, increasing by 7.3 percentage points. The poorer result was largely down to £16m of foreign exchange losses. Hiscox paid out no large catastrophe claims in the first half. At the bottom of the table is Novae, but the company should not be disappointed with this. Its COR was a solid 91% - a five percentage point improvement over the 96% it reported in the first half of 2013. This was despite catastrophe claims adding 2.3% to the COR. The company benefited from an improvement in its non-catastrophic claims ratio and an increase in reserve releases. 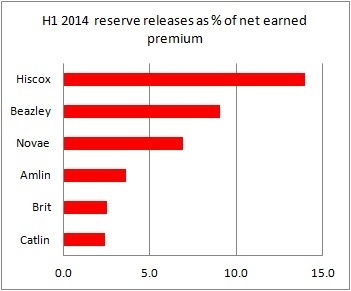 As well as being the best underwriter, Hiscox was also the biggest beneficiary of reserve releases from old underwriting years. It released £90m from reserves in the first half, which reduced its COR by 14 percentage points. The company that relied least on reserve releases was Catlin, whose COR only enjoyed a 2.4 percentage point benefit from reserve releases. The company with the biggest relative increase in reserve release benefit was Novae. Reserve releases improved Novae’s COR by 6.9 percentage points, compared with just 2.9 points of improvement in the first half of 2013. While it was the most profitable, Hiscox was the only company of the six studied to shrink gross written premium (GWP). Its GWP declined by 3.8% to £978.9m. However, excluding foreign exchange losses, it would have grown by 4.6%. Hiscox said that competition-fuelled reduction in its reinsurance income was offset by growth from its regional distribution networks in the US, Europe and the UK. Growth across the group was generally meagre thanks to foreign exchange losses and competition. For example Novae grew by just 0.2% and Beazley turned in just 1% of growth. 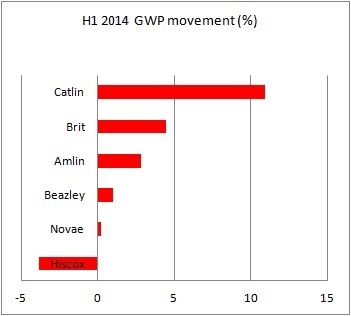 At the other end of the spectrum was Catlin, whose GWP was up by nearly 11%. Part of this was because, unlike most of its peers, Catlin enjoyed foreign exchange gains. The GWP was also boosted by the increase in the value of multi-year contracts written. Underlying GWP growth was 5%. Most companies benefited from improved investment returns after a prolonged period of weak results, fuelled by prolonged low interest rates. Beazley enjoyed the biggest turnaround in investment performance – its returns swung to $46.8m (£28.2m) from just $300,000 in the first half of 2013, when it was hit by interest rate rises. Other companies also enjoyed big improvements: Catlin’s investment returns jumped by 825% and Brit’s by 525.6%. The exception was Amlin, whose investment returns fell by 18.5%. The company blamed this on “low interest rates prevailing in most developed economies”. Lloyd’s insurers were more than robust enough to cope with the challenges that the first half of 2014 threw at them. Competition will remain tough in global reinsurance lines but recent performance shows that Lloyd’s insurers are diverse and specialist enough to cope. The big unknown for the second half of the year is whether a large hurricane will hit the US. If it does, this could completely change the picture at the full-year stage.